Note: You are purchasing a standalone product; MyManagementLab does not come packaged with this content. If you would like to purchase both the physical text and MyManagementLab search for ISBN-10: 0133768740/ISBN-13: 9780133768749. That package includes ISBN-10: 0133457230/ISBN-13: 9780133457230 and ISBN-10: 0133486621/ISBN-13: 9780133486629. MyManagementLab is not a self-paced technology and should only be purchased when required by an instructor. For undergraduate and graduate International Business courses. An effective balance between authoritative theory and meaningful practice. International Business is an authoritative and engaging voice on conducting business in international markets. 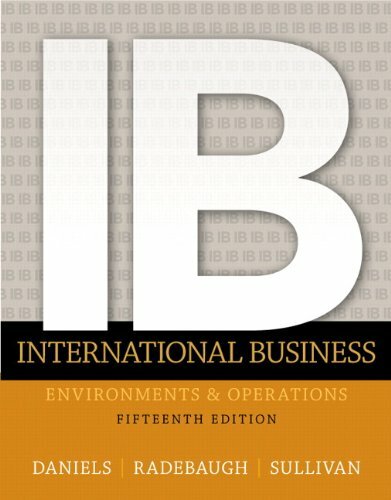 This text not only describes the ideas of international business but it also uses contemporary examples, scenarios, and cases to help students effectively put theory into practice. This edition features updated author-written cases, including ten entirely new cases, and expanded coverage on emerging economies. MyManagementLab for International Business is a total learning package. MyManagementLab is an online homework, tutorial, and assessment program that truly engages students in learning. It helps students better prepare for class, quizzes, and exams–resulting in better performance in the course–and provides educators a dynamic set of tools for gauging individual and class progress. Improve Results with MyManagementLab: MyManagementLab delivers proven results in helping students succeed and provides engaging experiences that personalize learning. Keep Your Course Current and Relevant: New examples, topics, and statistics appear throughout the text.